offering a higher potential return! 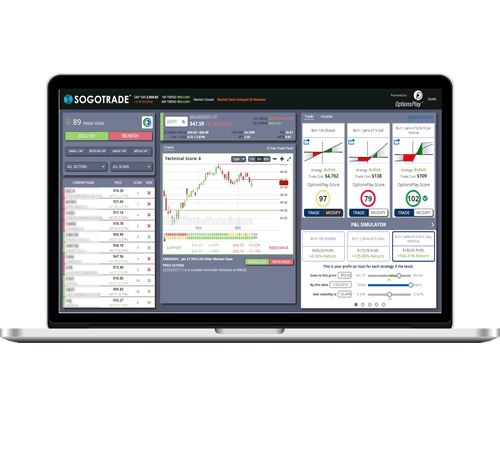 How does an existing SogoTrade customer get the SogoPlay tool? All you need to do is log in to your account and sign up for SogoPlay. As an existing customer, you will then receive complimentary access to SogoPlay. How does someone without a SogoTrade account get this research? This advanced research tool is made available exclusively to SogoTrade customers and a SogoTrade account is to required to access this tool. Important Note:There can be significant risk of losses in trading securities and options. Customers must consider all relevant risk elements including their individual financial circumstances prior to trading. Prior to buying or selling an option, an investor must receive a copy of Characteristics and Risks of Standardized Options. Please note fees, commissions and interest charges should be considered when calculating results of options strategies. Transaction costs may be significant in multi-leg option strategies, including spread, as they involve multiple commission charges. Supporting documentation for any claims will be supplied upon request. SogoTrade does not provide tax advice. Please consult with a tax advisor as to how taxes may affect the outcome of options transactions/strategies. Also, please note on December 17, 2009 the Securities and Exchange Commission ("SEC") approved a Supplement to the Options Disclosure Document ("ODD") providing information relating to options on indexes and the adjustment of stock option contracts. Any results posted are unique and are not indicative of any future results. Historical results do not indicate future performance. Sogotrade, Inc. does not guarantee in writing or verbally that material on this website or that taught in the videos or written material contained in the associated files that accompany the videos will result in a profit. For ease of simplicity, all examples used on this website and in the videos exclude commissions, interest and dividend and other transaction fees, tax considerations, or margin requirements, which are factors that may significantly affect the economic consequences of trades illustrated. The information contained on this site is provided for general informational purposes, as a convenience to clients. The materials are not a substitute for obtaining professional advice from a qualified person, firm or corporation. Consult the appropriate professional advisor for more complete and current information. SogoTrade, Inc. is not engaged in rendering any legal or professional services by placing these general informational materials on this website. Account user is entitled to a one month free trial. The free trial will begin on the sign up day and the trial will end on the last day of the following month. Once the trial period is over, the paid subscription service automatically commences unless the user unsubscribes to the service. Once signed up, an account that has executed 5 trades (stock or options) during the previous month or 15 trades over a three month rolling average will have free access Options Play; otherwise a $10 / month user fee will be applied. The user fee, if applied, will be charged on the 1st day of the month. SogoTrade Inc. is authorized to charge the cost of the Options Play fee from the cash balance in the account. Access to Options Play can be cancelled at any time via Account Settings. However, if the user is subscribed to the service on the 1st day of the month, he will remain chargeable even if he un-subscribes during the month. The monthly service fee, once charged, is non-refundable and access to Options play is non-transferable, even if the account is closed or transferred. Disclaimer: The information and content provided in the SogoTrade research center is for informational and/or educational purposes only. The information is not to be considered a recommendation or an offer of, or a solicitation to buy or sell any security or to employ any investment strategy. Your decision to engage in any specific investment or investment strategy should be based solely on your own research and evaluation of the risks involved, your financial circumstances and your investment objectives. Market data in advanced screening is provided and hosted by Cycle Prophet, Inc. Data and information is provided for informational purposes only, and is not intended for trading purposes. Neither Cycle Prophet nor SogoTrade, Inc. shall be liable for any errors or delays in the content, or for any actions taken in reliance thereon.